Wire, Debit or Credit cards. - FREE Live trading signals delivered 3 times daily 5 days a week. - Complete Education pack for novices and advanced traders alike. Designed to support long term – reliable trading. - Alvexo’s New Webtrader – user friendly, tailored reports and built in trading signals. From a regulatory perspective, Alvexo is regulated by CySEC under license number 236/14, and its parent company, VPR Safe Financial Group Limited, does business as a Cyprus Investment Firm with CySEC oversight under registration number HE322134. Alvexo also complies with the MiFID or Markets in Financial Instruments Directive, which gives the firm a standardized regulatory framework within which to operate as an investment services company inside the European Union. The MiFID helps improve transparency, operating efficiency and financial safety, and also provides enhanced consumer protection for Alvexo’s clients. Alvexo does not presently accept U.S. based clients, so they should look for another top rated broker. Alvexo features a team of high tech professionals and market veterans who aim to provide a comprehensive investment and trading service to give traders optimal prospects for success. The company offers customer support in multiple languages, several trading platforms, including MetaTrader, and it makes a variety of asset classes available for trading, including currency pairs, indexes, equities and commodities. Some accounts also allow the trading of cryptocurrencies and CFDs. In addition to a free demo account funded with $50,000 of virtual money, Alvexo offers four basic live trading account types to clients. Minimum initial deposits range from $500 for the Classic Account to $10,000 for the Prime Account. Between those extremes, the Gold Account requires a $2,500 deposit, while the ECN Account requires a deposit of $5,000. Leverage ratios vary between 50 to 1 and 300 to 1 for each live account type. Minimum dealing spreads range from 3.3 pips for the Classic account to 0.0 pips for the ECN account. Minimum dealing sizes are 0.01 of a lot for the Classic, 0.05 for the Gold and ECN, and 0.25 for the Prime Account. Account features also vary between the types and can include trading signals, an economic calendar, SMS alerts, technical analysis reports, one-on-one support, and access to a Senior Account Manager. Alvexo supports a basic set of trading plaforms, starting with the brokers’ own proprietary web-based WebTrader platform that operates on any up to date web browser and offers the usual technical analysis and position management functions. 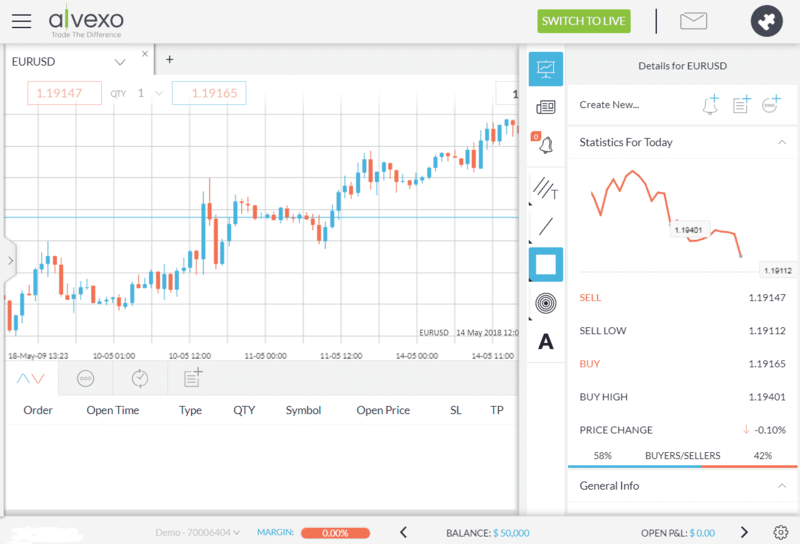 In addition, Alvexo supports trading via the world’s most popular free forex trading platform, MetaTrader 4, which gives a trader access to programmed trading options, including a wide range of third party automated trading programs called Expert Advisors, as well as many custom indicators. Those who want to trade and manage positions on the go will not be disappointed since Alvexo offers a fully-functional mobile app designed to work on Android and Apple iOS operating systems. The screenshot below shows WebTrader’s functionality including charts and account management features. To open a trading account with Alvexo, you will need a $500 minimum initial deposit that qualifies you for a Classic Account. Accounts can be held at the broker in either U.S. Dollars or Euros. You can fund a trading account with debit cards, major credit cards like Mastercard, Visa and American Express, and by using bank wire transfers. AvaTrade also permits electronic payments from certain providers. If you wish to start trading quickly, probably the fastest way to fund an account involves using your Visa or Mastercard credit or debit card, since funds will be credited immediately to your trading account. Bank wire transfers can take up to four days to get credited to your account. You can only withdraw the amount of money to a credit card that you deposited using that method. Any extra money will need to be sent to your bank account. Alvexo offers a multi-lingual customer support service via telephone in the United Kingdom, South Africa, France, Sweden, Italy, Cyprus, Spain and Romania. Support via email is also available for general inquiries, as well as to assist with compliance, finance and marketing matters. Fax numbers are available at the broker’s Cyprus, UK and Swiss offices. Alvexo also has a decent Trading Academy on its website where novice traders can learn the essentials of forex trading and pick up trading strategies by watching tutorial videos. More experienced traders will appreciate the section on advanced trading strategies, which includes developing a trading plan, performing market research and analysis, and learning techniques for refining a trading strategy. Overall, Alvexo may be relatively new to the online broking business, but it has the notable pricing advantage that an STP NDD broker offers to sophisticated traders. Still, that benefit gets negated somewhat by the volume-based commissions that the broker charges on trades in all but its Classic accounts that have the widest spreads. Also, being able to execute transactions in over 140 currency pairs, commodities, stocks, indexes — and sometimes even CFDs and cryptocurrencies — via the same broker will satisfy virtually any trader’s desire for a varied set of tradable assets. Furthermore, not only does Alvexo support the ever-popular MT4 and its expert advisors, but their proprietary WebTrader web-based trading platform is comprehensive, straightforward to use, and available using virtually any modern browser. The broker’s mobile app is also especially functional for those who want to trade on the go. Finally, Alvexo does provide useful educational materials and an expanding set of attractive account services that depend on the initial deposit made. These features make this broker a good choice if you can afford the rather high $500 minimum deposit and are willing to trade within the maximum leverage ratio of 300 to 1 that is lower than at some other brokers.